MSI has revealed some of its upcoming Z97 Gaming motherboards – the MSI Z97 Gaming 7 and Z97 Gaming 3. These motherboards feature the next generation Intel 9 series chipset, with Socket LGA 1150 and support the next generation Intel Haswell Refresh processors. Check out the Z97 Gaming 3 and Gaming 7 features and specifications below. The Z97 is the next generation Intel chipset that will support the upcoming Intel Haswell Refresh. It will also support the previous generation Intel Haswell processors. 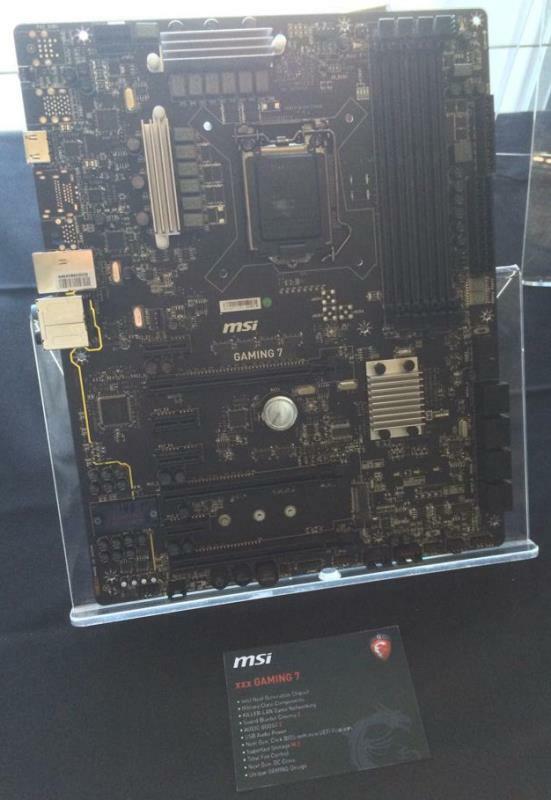 The MSI Z97 Gaming motherboards below are prototype motherboards. As you can see it lacks heatsinks, some ports and perhaps other features that are yet to be unveiled by MSI. But both the Z97 motherboards seem to feature Audio Boost, KillerLAN and M.2 NGFF interface. The MSI Z97 Gaming 7 will feature a 20 Phase DigitALL Power Design, as well as features designed to overclock the next generation Haswell Refresh processors. If you noticed there is a yellow line going from the rear audio ports to the audio processor, just like in Asus ROG motherboards. It has 4 Dual Channel DDR3 memory that will support up to 2666MHz (OC) memory clock frequencies. There are also three PCI-E x16 slots, as well as four PCI-E 3.0 x1 slots for expansion. Most of the rear I/O ports are still missing so we can’t comment on that yet. But it does have an M.2 interface that will support Intel 530 Series SSD NGFF. The MSI Z97 Gaming 7 also has 8 SATA 6GB/s ports, and some USB 3.0 headers near the onboard power, reset and probably OC Genie button. Meanwhile, the MSI Z97 Gaming 3 looks like a trimmed down version of the Gaming 7. But it still features AudioBoost, Military Class Components, and M.2 interface. However it does have fewer SATA 6 GBps ports, and no Power, Reset, OC Genie buttons. There are however a combination of PCI-E 3.0 x16, PCI-E 3.0 x 1 and PCI legacy slots. The MSI Z97 Gaming 3 is probably their mainstream motherboard targeted towards consumers who do not overclock often, or doesn’t at all. Currently there is no available information regarding its price or release date. I’ll keep you updated about these new Z97 motherboards soon.